The Chilkat XML API provides a number of Search* methods for locating XML nodes based on criteria. These methods traverse an XML document in a breadth-first order. (See Breadth-First Search). 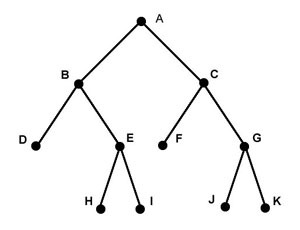 The nodes are traversed in the order: A, B, C, D, E, F, G, H, I, J, K.
//  of nodes (or more). //  NOTE:  The search is always rooted at the calling node. //  the root node of a sub-tree.